Any questions? Pop your details in the form below and we’ll give you a free call back! 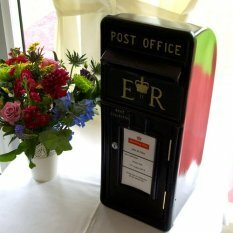 We have a many Wedding postboxes in stock for you to hire throughout the UK. You can choose from a Red Wedding post box, White Wedding postbox both of these colours are genuine cast steel postboxes or alternativley we have Fibreglass replicas that are available in the following colours. An Ivory Wedding postbox, Black Wedding postbox, a sparkly Silver Wedding postbox, a Cadburys Purple Wedding postbox, a Lemon Yellow postbox, bang on trend for Weddings in 2015 we have a Mint Green Wedding post box too and as far as we know we have the only Pink Wedding postbox in the North of England! If there’s not a colour you like in stock then take a look at our custom painted Wedding postbox service. Want something a bit different? Then have a look at our retro suitcase, Vintage wooden trunk or the Treasure chest. All of these wil make great Wedding postboxes. We also have a Crystal wish tree too so your guests can leave you a message on your Wedding day. One of our Ivory postboxes is at the The White Hart Inn today for the new Mr & Mrs Lewis.